Ofunato Yataimura (大船渡屋台村) is one of temporary food districts with portable stall constructions located in Ofunato, Iwate Prefecture. There are about 20 different restaurants and Japanese Bar, Izakaya. At night, it will be very populated. You can enjoy all kinds of local foods that captured at Ofunato Port. Most of the shops open at night. This mall has been closed but for the memory of the restoration, we keep this video. 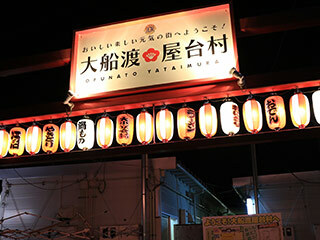 Ofunato Yatai Village is the restoration shopping mall located Ofunato city, Iwate prefecture. It is the symbol of the restoration after Tsunami in 2011. There are many great restaurants and bars that offers great foods and Sake of Ofunato. Great things about this shopping district is that there is open space where you can bring all meals, sake and dishes from all different stores and you can have a party. Also, if you are drinking at one bar, you can order to the other restaurants and they will bring their food to you.